Smooth enough for a body and lens style setup. Can handle a fare amount of weight if need be. 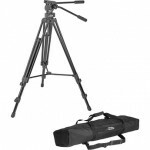 Great tripod for starting off or if you need a small travel tripod. Much steadier than the Pearstone. Q.R. Plate blocks T2i battery. Camera plate with long travel (but has retarded quick release system). Telescoping Legs (I prefer over stacking style). Comes With 2 Handles and a Bag. QuickTime File: DSLR Video Shooter Episode #012. 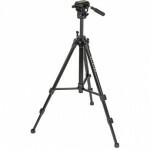 Why dont you list Libec TH 650DV fluidheaded tripod? I’m also using that for my HDSLR works and Canon XHA1s . .
working pretty amazing . .
Great stuff, it was a long one but a good one! Very helpful since I still need one. It was waaayyy longer LOL. Had to edit it down to about 6 minutes per tripod. Just wondering if you plan to do a video like this or have any similar input regarding monopods? Needed a new tripod, couldn’t decide, been looking at various blog posts/reading reviews, saw this video, pulled the trigger on the D&S Provista using your link. Thanks for the help. Thats a good idea. Although personally I just like using a smaller tripod all the legs closed but one. Glad to be of service Kevin! I’ve had that tripod and head for a couple of years now, and it completely rocks! One of the great steals of the low-budget world. Nice roundup, Caleb. I got the Bescor thru B&H (I think you may have even mentioned one of my review comments) that the release plate is very tight. That is true out of the box but after continued use it loosens up and handles quite well for the money. If you get around to reviewing your fancy RR shoulder rig I’d like to see that. Keep up the good work. Yeah I am planning on doing an ep on the RRM rig as I have had it for a year. Ravelli has a great product here for under $90! Check out max operating height and the all metal construction of… everything! Weighty legs too. I have the Pearstone… nice but the neck is too flimsy, but a great buy at 60 bucks. 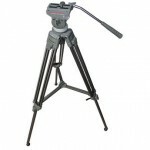 Only tripod at that price range that you can get good tilt/pan action. I’ve used Davis and Sanford, I have a tripod that is like both the Bescor and Matthews, and I don’t really like it. I’m a big fan of the manfrotto heads, especially the 501HDV. The others seem to only work well with heavy rigs, and I usually don’t have more than the camera and maybe an audio receiver on my tripod. Manfrotto has always given me the same resistance regardless of camera weight, the others seem to either resist too much or too little depending on weight. Great review. I’ve been using two D + S 7518 tripods shooting weddings for over 3 years now and they both continue to work great! I’ve upgraded a little with them as time has gone by too. I’ve replaced the D+S heads with a 701 hdv head and a 501 HDV head so that I can mount the 501 plate to my cameras and switch back and forth between all my gear without having to switch plates. The manfrotto 75mm half bowl fits right onto the D+S 7518 sticks. Also my 3rd shooter has one and he added the 501 plate adapter to it (Actually its the “Calumet Quick-release Video Head Adapter” that accepts 501 plates) which you can buy for $32.99 and do the same thing if you want to use the D+S head. I’ve used the Manfrotto 525MVB sticks quite a bit and I actually still prefer the D+S 7518 sticks for live events because they’re quicker to fold up with the mid level spreader and move and adjust height quickly with. Can you remove the head from the Pearstone to use on some other legs? Yes. But you would have to have a head that uses 1/4″ threads. All the while when I just wanted the tripod that you reviewed! Anyway, this seems like a really good tripod too, but have you used it before? Any opinions? Also, what is the “R” word? And I LOVE mine. You can get down to 8 inches from the ground with it. As for the “R” word, I think he is referring to when I said retarded. Of course I in no way am referring to people with disabilities. But apparently I offended someone. Great video.Thank you very much. Hey Caleb, thanks for the overview!! Is there any way to get the ball off the bottom of the FM18 head so it could be mounted on a slider etc.? I know there’s a flat 3/8 version that you can buy without legs, but I wonder if the ball version could be later modified in this way. Many heads can be, but a few can’t, like the Manfrotto 504HD. Thanks! Yes I believe you can. It is a 3/8t thread. Great review thank you for sharing. Wondering what counterweight you’re using on the shoulder rig, and the length of your support rods. Thanks! 18-24″ and I used some astronomy weights I found. 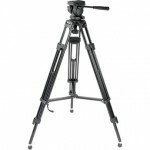 With the Davis and Sanford tripod, could I replace the head with the 502HD Fluid head from Manfrotto? I was wondering if the FM18 can be removed from the half-ball and used as a flat head?I dig the legs and bowl but would prefer the MVH500AH as a head.